Calumet is the answer when it comes to hauling bulk liquids for your farm operation. Our newly introduced MRK6000AG steel trailer series offers 6,000-gallon capacity, wireless remote control, a high-volume pump, plus a remote controlled 6” x 16” intake and discharge boom. Offering a wide and uniform spray application pattern, Calumet’s ag trailer yields reliable results season after season. 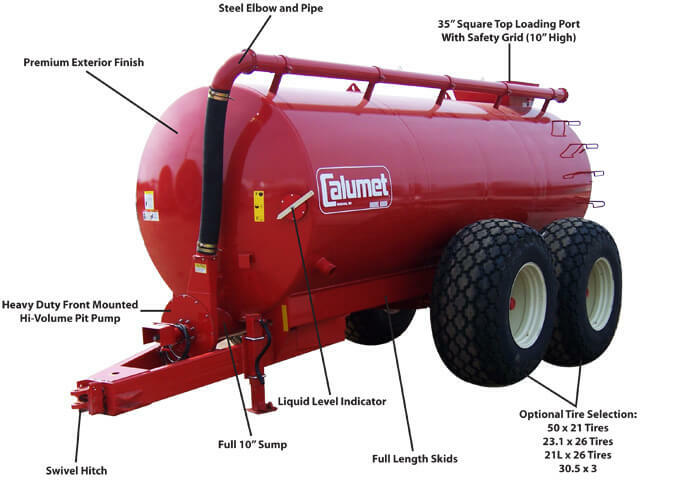 Calumet spreader tanks feature 1/4″ steel construction, front-mounted high-volume pump, power take-off, over-the-top discharge, tandem walking beams, central grease banks, adjustable undercarriage, swivel hitch, 35″ square top loading port, 540 or 1000 R.P.M. and more. Calumet makes the chore of agitating liquid manure easier. 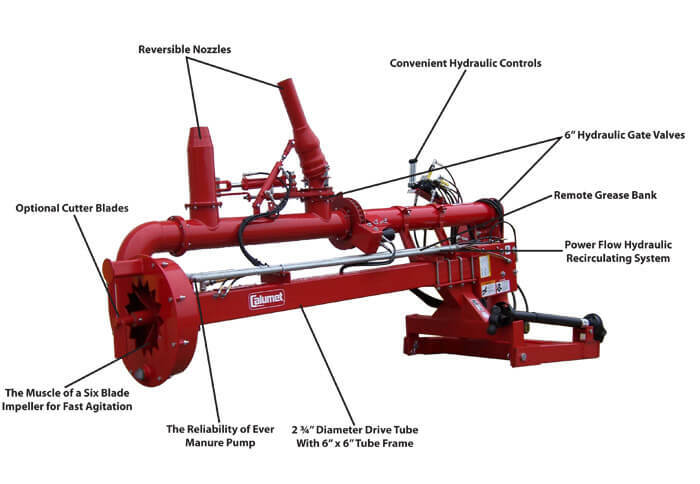 Designed for large farm operations or commercial haulers that need extra power, our high-volume pit pump offers convenience and rugged construction to completely agitate manure pits without wasting time. 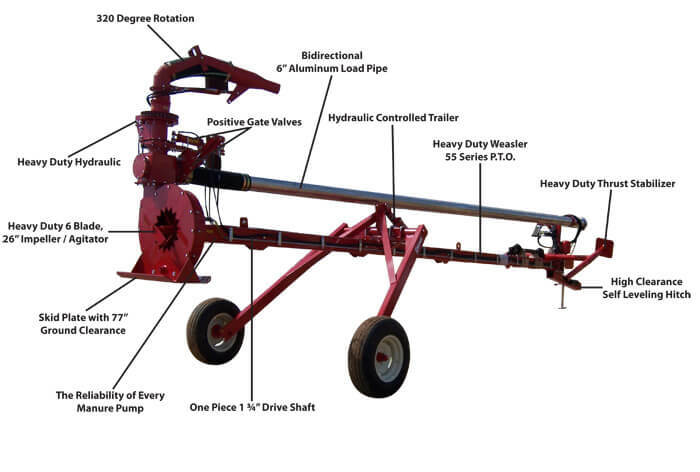 This pump combines the volume and pressure needed to blast manure over, under, around and through any size liquid pit. The Calumet 8″ lagoon pump with 8″ aluminum tube fill will deliver an impressive 8,500-plus gallons of water per minute with a standard 540 RPM power take-off drive. When it comes to keeping dust where it belongs, nothing short of a rainstorm can compare to our dust control tanks. 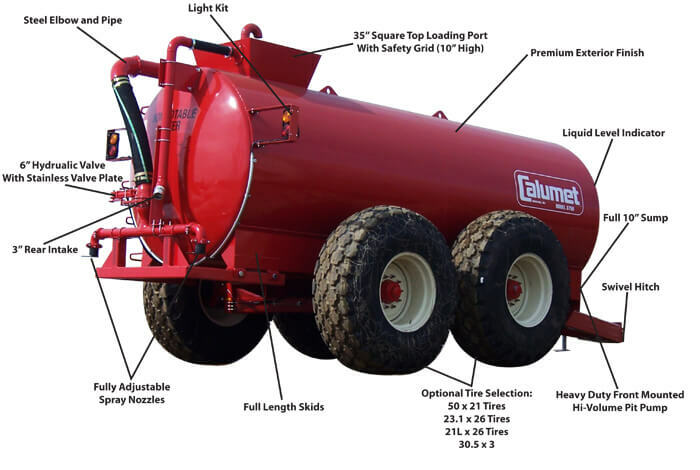 Top-fill or vacuum, pull-behind or truck-mounted, Calumet offers sizes from 2,250 to 6,000 gallons. 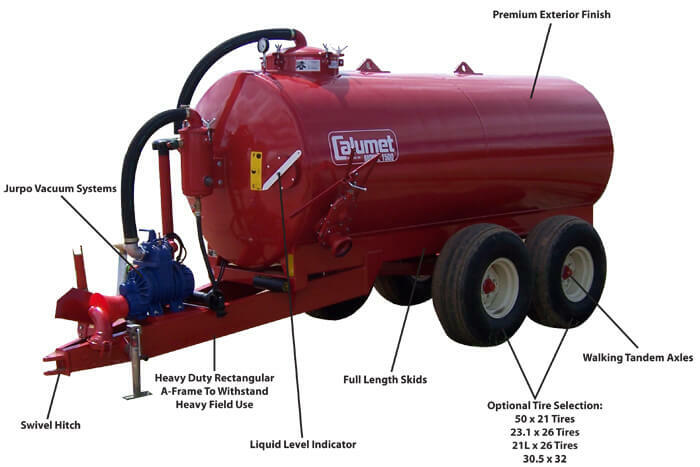 You can depend on the versatility, convenience and strength built into Calumet every tank. Calumet vacuum tanks feature 1/4″ steel construction, optional vacuum pump (from 177-353 CFM), power take-off, tandem walking beams, central grease banks, adjustable undercarriage, swivel hitch, 4″ or 6″ side fill, 20″ top hatch, 6″ cast iron discharge valve and more.